What is an In-service 401K Rollover? One of most common questions I get from retirement savers is how to do a 401K rollover while still working for an employer. We have talked about the power of a 401K rollover and the overwhelming benefits of an individual retirement account (IRA) but the common wisdom is that you can only roll your money into an IRA when you leave your employer. In fact, there is actually an option called the in-service 401K rollover that may let you keep working for your employer while benefiting from the flexibility and control of an IRA. 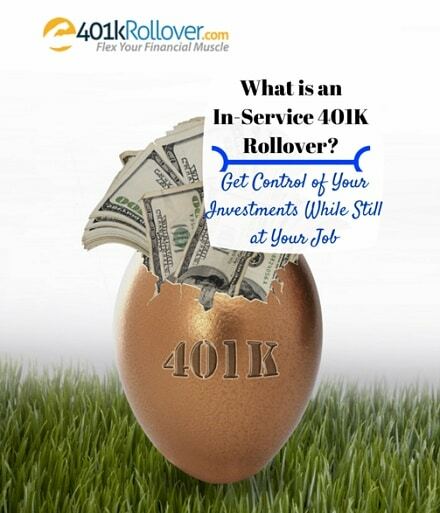 An in-service 401K rollover is exactly what it’s called, an opportunity to roll your 401K assets into an individual account while you still work for your employer. This would be in contrast to an orphan 401K rollover which is where you roll your retirement assets from a former employer into a new employer’s 401K or into an IRA plan. According to the Profit Sharing Council of America (PSCA), up to 77% of 401K plans include a provision for in-service 401K rollovers. Many of these only allow plan rollovers when a worker reaches a triggering event such as reaching retirement age, disability, plan termination or reaching the age of 59 ½ years. There are some plans though that offer the ability for an in-service 401K rollover without these triggering events, basically rolling your retirement assets into an IRA whenever you choose. There may be other requirements to an in-service 401K rollover like holding the assets in your 401K for at least two years or having the plan itself for at least five years. Get a copy of your employer’s summary plan description (SPD) for your 401K plan and look for any rules on in-service 401K rollovers. You can also ask your 401K plan advisor or the administrator though they might not want to tell you that assets can be rolled over to an outside IRA you control. If your current 401K plan doesn’t allow for in-service rollovers, you should petition the company to rewrite the plan description or change plan administrators. This is a huge benefit to retirement savers, giving them the flexibility and control they need over their own investments. While most 401K plans restrict investments to a small list of funds that charge the highest fees and provide advisors with the largest kickbacks, IRA investments allow you the ultimate flexibility to invest in stocks, bonds, real estate, precious metals and even start-up businesses. An IRA puts you in control of your money and helps avoid corporate or advisor malfeasance. A recent study by professors at the University of Chicago found that up to one in five advisors at some firms have been disciplined for misconduct with client money. Including the option of in-service 401K rollovers in a 401K plan costs the employer nothing. Many employers not offering the option may simply not understand that it exists. Plan administrators and outside 401K advisors certainly are not going to bring up the subject because it could mean less assets for them to manage and on which to charge exorbitant fees. Rolling your 401K into an IRA doesn’t mean you lose the benefit of employer matching in the future. You are still allowed to keep your 401K plan active and contribute to it and benefit from tax-deferred investing. Performing an in-service 401K rollover just takes that portion of your retirement account and transfers it into a retirement account you control, one with greater flexibility to choose your investments.